Broad employee stock ownership in all size companies is the primary reason for the rise and prosperity of such dynamic communities like Silicon Valley, Seattle, Nashville, Minneapolis, Dallas, San Diego, and other towns. One form of employee stock compensation are stock options giving the worker the option to buy stock at a pre-established price sometime in the future. 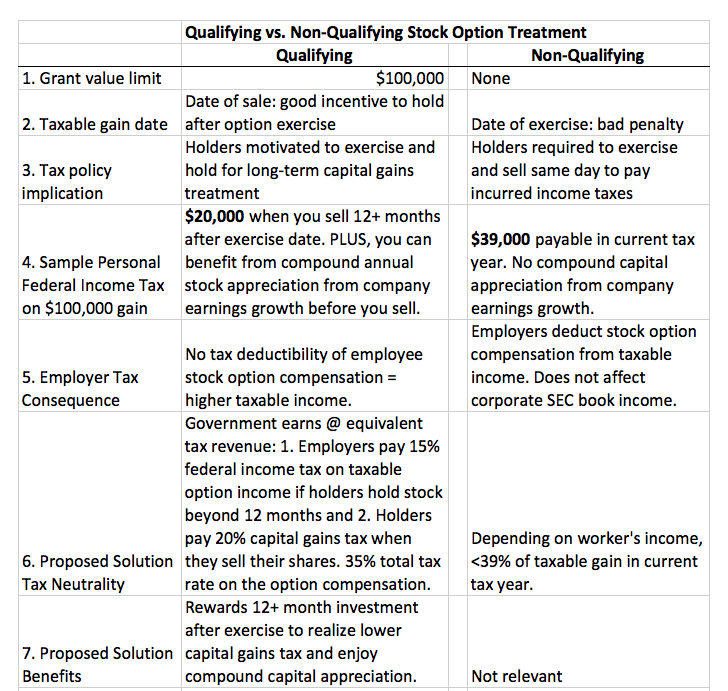 Today’s IRS regulations provide for two types of stock options: Qualifying and Non-Qualifying Stock Options (more in Problem below, but first back to the Facebook story). At the time of their IPO, Facebook paid US tax authorities $2.86 billion of withholding taxes on $6.347 billion in employee stock option compensation (44% state and federal tax rates) and reported an additional $2.120 billion in unrealized stock option compensation gains for fiscal year 2012. The sum total of employee stock-related wealth is roughly $8.467 billion!¹ Unfortunately, current IRS tax regulations require stock option holders to incur a taxable gain when they exercise stock options equal to the difference between the exercise price and current market price. In other words, holders are forced to exercise and immediately sell their shares to pay the income tax on the gain. Tragically, the IRS removes any long-term incentive for workers to exercise options and hold their shares for 12+ months so they could realize lower long-term capital gains rates (eg 20% deferred federal capital gains rates versus 30-39% ordinary income rates). Employees from cooks and painters to executives were forced to sell stock at the IPO rather than invest long-term in the company. In doing so, they lost roughly $2.86 billion in value because they paid 44% ordinary income tax rates versus 22% long-term capital gains rates at the time. Moreover, Facebook reduced its taxable income by $2.86 billion in 2012. Facebook’s pre-tax 2012 income was $538 million so their taxable income would have been 500% higher if IRS regulations allowed stock option recipients to exercise and hold stock options for more than 12 months. The Problem: IRS regulations inappropriately classify two types of stock options: 1. 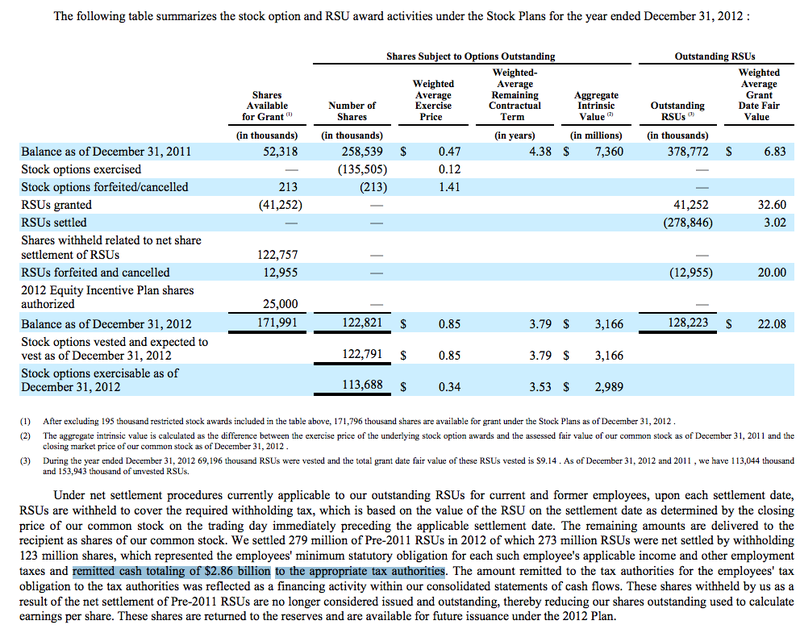 Qualifying stock options which are capped at $100,000 of market value options/employee/year and 2. Non-qualifying stock options with unlimited grant value. Qualifying options allow holders to exercise options and incur taxable event only when they SELL their stock. which is the correct approach. Non-qualifying options require holders to incur a taxable event at date of exercise equal to difference between exercise and market price, which means holders sell their shares upon exercise to pay the income tax. The issue is the difficulty for companies, especially publicly-traded companies with quoted stock prices, to issue less than $100,000 of market value stock options and still reward employees for good performance. Let’s say you are a 5-year employee making $50,000/year in compensation and the company wants to reward you for ongoing good performance. The company stock trades at $50.00 so the company can only issue you 2,000 stock options at $50.00/share to have ‘qualifying stock option’ status. The stock has to appreciate 20% or $10 for you to make $20,000 of extra performance income. And there is no guarantee of that company performance even though you work hard. The Solution is to make all stock options ‘Qualifying Incentive Stock Options’. Tax policy should motivate workers to exercise their shares, invest capital in their companies, hold on their shares to build wealth as shareholders and loyalty as employees, and only pay capital gains taxes if they sell their shares greater than 12 months from the exercise date. One simple change in the tax code would radically instill an Ownership mentality in all workers. The table below describes the differences between Qualifying and non-Qualifying options. 1. 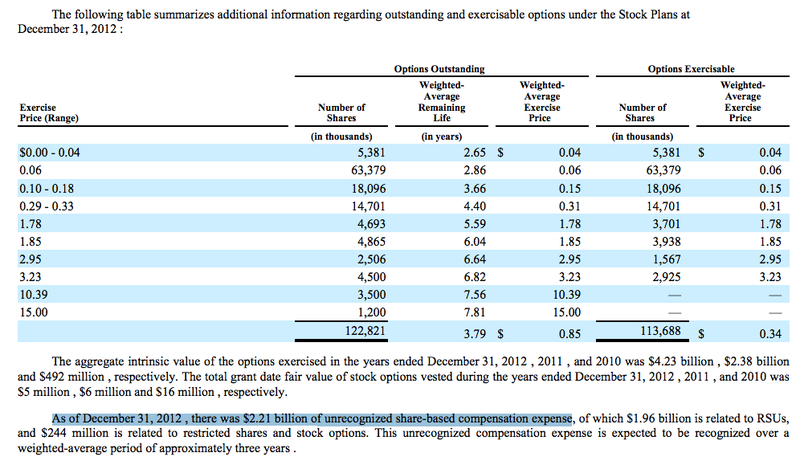 Facebook 2012 10-k Filing: Stock Option Compensation sections.